If ever there was a reason for young TV addicts to haul their bottoms off the sofa, it’s the SpongeBob SquarePants – themed villa in the Dominican Republic. 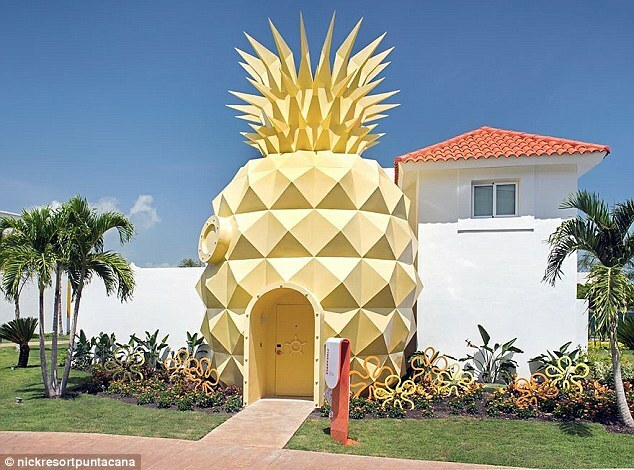 Fans of the cartoon, about a yellow sponge who lives in a pineapple with his friend Gary, the snail, at the bottom of the Pacific Ocean, can now re-enact their favourite episodes inside the replica house. But the condo, which is built at the Nickelodeon and Nick Resort Punta Cana, costs $3,800 a night to stay in, so it doesn’t come cheap. Inside, the 1500-square-foot living space has been designed with elements inspired by the sea, it comes complete with nautical accessories throughout, including a shell phone and a life-sized statue of Gary. The two-bedroom, three-bathroom Pineapple features an infinity pool which is considerably larger than SpongeBob’s own humble dwelling though, housing four adults and two children comfortably. It also has a private butler on hand at all times to take care of guests’ needs, should they want anything from a moonlit beach dinner prepared by a world-class chef, to an in-suite afternoon tea party, or a pizza party and a pyjama party for all the family.